Pictured, left to right: Siobhán Pollard, Natalie Ryan, Marie Molloy. 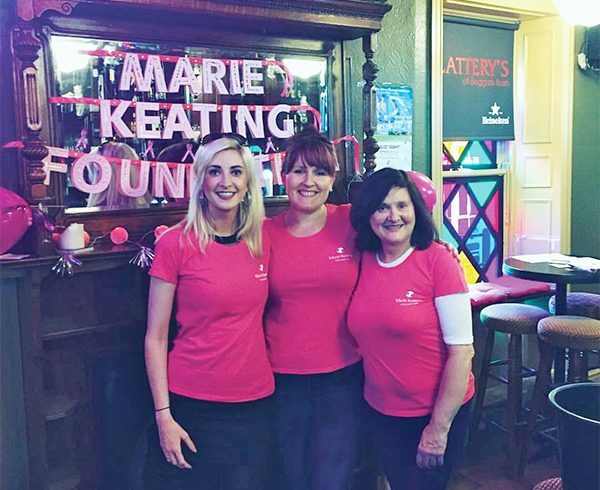 On behalf of the Marie Keating Foundation, Marie Molloy and Natalie Ryan would like to express their sincere gratitude for the tremendous support they received from family, friends, neighbours and colleagues (CPAS and CIF) when hosting a Table Quiz on Thursday 11th August 2016, in Slattery’s of Bath Ave. Thank you to everyone who attended on the night, to those who bought raffle tickets and those who made donations on-line. The night would not have been the success it was without the generosity of those who donated prizes, namely: N & R Ryan, Viking Splash Tours, SuperValu Ranelagh, Hickeys Pharmacy, Maynooth, Cafe Moda, Rathmines, Carton House Golf Club, Maynooth, Lydia’s Mobile Hair Salon, Barbers Inc, Rathmines, Paddy Wagon Tours, Tribeca Restaurant, Ranelagh, National Concert Hall. Also, an enormous thank you to Morton’s Supermarket of Dunville Avenue, who very kindly granted us a bag-pack on 6th and 7th August 2016. In total, €3,134.05 was raised for the Marie Keating Foundation. Funds raised will enable them to reach more people with life-saving cancer information and support services.